SlovoEd Compact Italian-Russian & Russian-Italian dictionary includes the most common translations with clear, concise definitions. It can be applied during a trip abroad and when reading. The dictionary database is powered by Dario De Judicibus and contains 11283 entries. 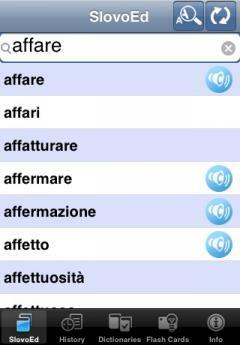 · Audio pronunciations made by Italian native speakers. · No Internet connection required: simply download the dictionary to your iPhone/iPod touch. · Hyperlinks between articles and directions. · Search History of the last 100 translated words. · Wildcard Search if you are unsure of the exact word spelling. Use “?” and “*” symbols to replace the missing letters. · New! Easy copy-and-paste functions copy words to the clipboard for translation. · New! Contextual menu (Translate, Morphology Module, Pronounce). · New! Improved browsing capabilities through word list and Search History. · New! Search for anagrams. · New! Enhanced customization options allow you to modify animated menus and choose background colors.